In an interesting development the Government appears to have extended its £60m 2Mbps for all rural broadband (USC) subsidy scheme to include fixed wireless ISP Quickline in Lincolnshire (England), which is big change from the initial focus on Satellite based solutions. The scheme was officially established at the end of 2015 (here) and focused upon an estimated 300,000 UK premises that might not benefit from the Broadband Delivery UK roll-out of “superfast” (24Mbps+) fixed line broadband services. Broadly it’s been seen as a quick-fix solution to help meet the original ‘2Mbps for all‘ Universal Service Commitment (USC). In simple terms it offered grants worth up to around £350 that could be used to reduce the initial cost of having a Satellite broadband connection installed. However not everybody is a fan of inferior Satellite connectivity and initial uptake appears to have been very low (here), which might explained why the Government appears to be diversifying their approach. This is part of the government’s commitment to give access to 2Mbps download speeds to all premises in the UK. 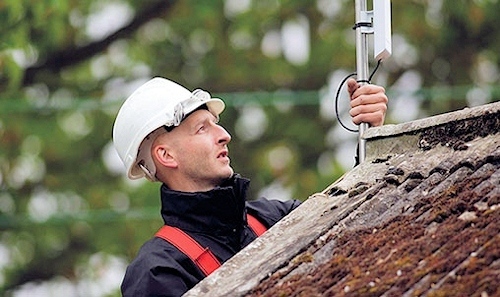 Local authorities in conjunction with Broadband Delivery UK (BDUK) are making available the option of a subsidised basic broadband installation for eligible premises in Lincolnshire, which is notorious for its poor internet connections due to the vast rural area. With Quickline’s wireless service, this voucher will make the installation completely free for residential properties in parts of Lincolnshire, in particular West Lindsey. If you do not currently have access to broadband speeds of more than 2Mbps already, you may be eligible for the voucher. Fixed wireless connectivity is a far more capable option than Satellite and Quickline already has a reasonably well developed Fixed Wireless Access (FWA) network in Lincolnshire, not to mention that they’ve also been involved in one of BDUK’s local pilot schemes (here). Subscribers would ordinarily pay around £150 (one-off) for installation on a 24 month contract term and then £29.99 per month for an unlimited 10Mbps service, which rises to £59.99 if you want a 50Mbps connection. Obviously under the new approach this installation would now be free, assuming you live in the county of course and are within reach of the network. The decision to pick Quickline as an approved supplier suggests that the Government are slowly opening up their funding to non-Satellite alternatives, which is a good thing. Very much overdue and a huge oversight. So they finally realised that Satellite is never going get any better and the lag prohibits many modern internet uses only taken them years. This is potentially very helpful but a few questions do need answering. Does this set a precedent for othet local authorities? As with the satellite option, does this not preclude future subsidised upgrading to fibre at a later date? Will local authorities (or government for that matter) use this as an excuse to take their feet off the pedal for continuing fibre deployment? As an interim, fine, as job done, certainly not. Should not affect later investment in infrastructure due to the limitations in bandwidth. A saturated cell will not have substantial guaranteed throughput for all the subscribers, fixed line technologies habitually develop faster than wireless, so the differential will be the “step-change” required. From what I read, the satellite voucher was specifically not an impediment to being funded for future superfast work. However, most (even government) would say that satellite might be fine as a 2Mbps “basic” replacement, but isn’t a proper superfast replacement. Not yet, anyway. However, some fixed wireless setups could be considered superfast-capable – even if they need an upgrade to get there. Using a “satellite” voucher for wireless could well be perceived as having taken you not just to “basic” but to proper “superfast” too. I use a 5km fixed wireless link to access superfast broadband. It works great in gales, heavy rain/snow and sub zero temperatures. Trace route shows the wireless link hop only adds about 2ms to the latency. My wireless link capacity easily exceeds the 80/20 “fibre” connections capabilities so plenty headroom to play with if BTOR ever roll out more than 80/20 from the cabinet. I agree that a wireless link, newly installed, is inherently superfast-capable. You wouldn’t bother with anything slower nowadays. But a full superfast experience depends how many you are sharing it with. As you mention below – 3Mbps ADSL is just about bearable if you don’t share with anyone else in the house. Likewise a 150Mbps AC wireless link can be endured provided you control how many homes share it. My comment was more about existing WISPs, with existing hardware, and other clients. Their setup might not have progressed to a superfast design yet – but it is probably capable of it. Definitely. At least fixed wireless has far more scope to improve incrementally and react quickly to market needs, something that satellite based broadband services are always going to struggle with. A very sensible move where the local geographic topography and population distribution makes it suitable. A bit of sensible pragmatism, and should, in principle be relatively quick to deploy. I think people would rather have 10mbps now that wait 5 years for something superfast. I’ve gone from a 2 to 3Mb ADSL connection to an 80/20 connection via a 5km fixed wireless link. I’d go as far to say that with a 3Mb connection, you can do most things with a little bit of patience *IF* you are the only person using that connection. The problem for me was a family using/sharing that connection. Its great to have more bandwidth than I need for a change but I think many people would benefit from a 10Mb connection in short term. This could cause problems in a few places. In most local authority areas all the government subsidy for the second phase of roll-out has either been spent or at least committed. In Shropshire, Herefordshire, Devon and Somerset (maybe more) this is not the case, and large sums of money are sitting there awaiting the arrival, subject to the outcome of a consultation in a couple of months, of new EU State Aid regulations which will determine how this money can be spent. What is known is that it can be spent on fibre broadband, and it will probably be deployed in smaller contract areas than before. What is not known is what organisational structures will be permitted to make use of the cash. In areas where the Phase 2 money has been spent the choice for communities with poor connections and no existing wireless provider is fairly straightforward: work with your neighbours to aggregate vouchers and bring in a good quality fixed wireless provider because there’s no telling when/if fibre broadband will ever come your way. But where the Phase 2 money hasn’t been spent things could be more complicated. Firstly, if some people are tempted by FW now rather than the possibility of fibre later, will a wireless provider risk capital outlay on a mast if the local authority might later try to overbuild them with fibre using the unspent Phase 2 money? Anyway, the option of fibre provision for those who prefer to wait should not be precluded because there is the minimum number necessary to attract FW. But how will those who want to wait know how likely they are to benefit from the unspent Phase 2 cash? Now to Fibre. How can a local authority confidently go out to competitive tender if interested companies are nervous that the take-up they would require if successful might not happen because significant numbers of people might opt for subsidised FW? Experience with gas and electricity supply shows that the population remains averse to switching suppliers, and there could be nightmare scenarios for users with multiple on-line accounts who might have to change email addresses. Of course all this might be entirely hypothetical if BDUK only permits the use of vouchers by local authorities that have spent all their phase 2 cash and are close to 100% coverage. Or if the local authority decides to complete its Phase 2 tendering before approving FE vouchers. I wonder about those “significant numbers” opting for subsidised FW. In the trial counties, they had terms that also specified you had to be “sub-2Mbps” and there was no immediate prospect of being upgraded. In the context of counties that have already spent their funds, an “immediate prospect” could include looking at plans for the next year, and be relatively easy to answer. In the counties that haven’t spent their money, and are waiting for EU approval, that unknown prospect could put a kybosh on things. fiewipie. the main problem is going to be feeding the wifi. There is no open access to state funded fibre. The only open access is to the myriad of ISPs reselling openreach connectivity. FiWi is a brilliant idea though, and starts to generate income so that the wifi links can eventually be replaced by fibre, whilst still providing a much better connections than copper or satellite. As for email addresses, its madness to use a ‘free’ one from an ISP, once you’re on a decent connection you can use the ‘free’ web based ones or even buy your own name so you are independent and not tied to one supplier. Looks good as provides reg option for superfast speeds of 30MBps. Should be be given the option elsewhere but at superfast speeds not a cap on 10Mbps. I understand this is available In North and North East Lincolnshire as well after speaking to the local council. Great idea from DCMS rural communities should have access to 10 meg and above. Location and population size shouldn’t be a barrier! I think that Fixed Wireless has far more long term potential than FTTC in rural areas. FTTC offers little for the future and G.Fast will never be viable in rural areas. Even now the best speeds in rural West Sussex are from Kijoma – a Fixed Wireless provider. With sufficient backhaul there is no reason why hybrid networks with FTTP in the population centres and Fixed Wireless in the surrounding areas should not become the norm. It might be take up of the Satellite Broadband Subsidy is low because not all Local Authorities are implementing it. Connecting Devon & Somerset seem to be refusing to implement it so I can’t apply for a elegibility code. A massive publicity campaign costing millions will shortly be implemented for satellites. This will change awareness and more people will apply for them, which then cuts out the wifi networks who won’t get any free state funded publicity. This is so that BT can still keep its monopoly with its satellite partner supplying the rural areas. They just have to make sure there is no other competition, and this is the way they’ll do it. The massive advertising budget will also keep the meeja onside and prevent any investigative reporting, so all we’ll see is regurgitated press releases and ‘homes passed’ statistics. Its all a superfarce. What about Aberdeenshire? The speeds are awful, i’m currently getting 0.9 mb down and refuse to pay for Satellite. Its over priced, data capped and has dreadful ping. Not good enough, This country is NOT a leader in Broadband connectivity. Joke. I sympathize with anyone with less than 1 Mbps (2 Mbps would be nice) as we can only get 0.6 Mbps (rural Norfolk). Added to our frustration, we live within 5 miles of a town where you can get 100Mbps and only 2 miles from another village where you can get 20Mbps! The BDUK scheme only helps some of us but it’s not a permanent answer to the rural broadband problem. Where we are, we can’t receive any form of wireless broadband (we are out of range) so satellite is the only option. I agree, satellite internet costs far too much, especially for those who need more than a 8Gb monthly data allowance. The problem with extending this to wireless is that one of the criteria for getting a voucher is that there is no alternative that gives more than 2Mb. If the customer is in coverage of a wireless provider they cannot get a voucher. So really only useful if the wireless provider extends their coverage based on an order from a customer with less than 2Mbs. The cost of this would be far more than the subsidised payment. Once the new repeater is installed it then means that other customers in that area would not then get a voucher. Not a scheme set up for wireless and fits satellite better, should have tailored it a bit.